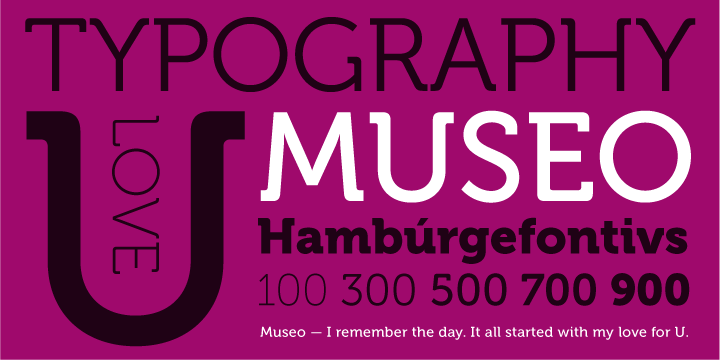 Museo is a result of creator Jos Buivenga love for the letter ‘U’ in uppercase. The image inspired Jos and he modified it via bending top portions of the stems into semi-slab serifs. This theory helped Jos to work out the rest of the uppercase letters. He first wanted to create all-caps display font, but changed the idea to get something versatile. Hence, lowercase was added and the spacing and kerning were adjusted to enhance legibility. Available in 5 weights, each supporting CE languages and Esperanto, this font is simply a treat for typeface lovers.